Illuminate your room with the brilliance of our Snowman Electric Tabletop Lamp. Celebrate all season long with this Hand-painted embossed artistic glass lamp. 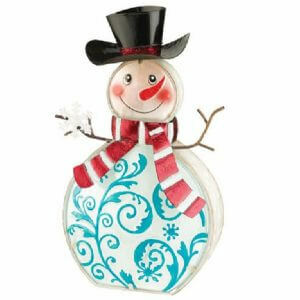 In an adorable snowman motif with accented red and white scarf he makes a fantastic accent, especially to light those long winter nights. Ideal as a night light for a child’s room as well. Collect all three designs – Santa, Snowman, and Christmas Tree for a glowing snuggly Holiday display! The Snowman Electric Tabletop Lamp consists of hand-painted embossed glass in a neutral white with aqua scroll motif. Snowman has an added elegant black top hat and winter scarf in a striped red and white made of painted metal to accent his unique winter nature. In addition, his arms hold out the winter snowflake for all to take in with a traditional metal look. 5 foot electrical cord graces the lamp for extra length for those hard to reach outlets. Use this adorable snowy man all season long – he’ll light your way to a beautiful holiday.